For an easy meal on a chilly winter night we decided a casserole was the way to go. Our casserole consisted of roasted brussels sprouts and broccoli, topped with creamy grits flavored with applewood smoked bacon, then layered with sauteed onions and mushrooms deglazed with sherry vinegar. Finally the dish was topped with shredded sun dried tomato & herb double gloucester cheese and baked until bubbly and melty. A: mmm hmm! i know some people aren’t the biggest casserole fans but what’s not to love… generally. T: I don’t see how someone can be against casseroles. It’s too general a thing to be against… surely they just haven’t had the right casserole. A: maybe all they’ve had is tuna casserole, which frankly scares me. brian… if you’re reading this, leave a comment and tell us why you are against casseroles! curious minds are dying to know. T: I suspect some people have trouble with texture inconsistencies too. A: that is such a weird thing to me! the thought of only eating food that is mono-textured is just… weird! i can’t think of another word for it. T: I think it’s weird too, but I used to be that way! Up until I was a teenager I didn’t like to get a random crunchy thing in a meal that was otherwise soft. I guess I knew I didn’t like crunchies because I knew I didn’t like veggies. Carrots & cheese. Lots of cheese. A: for real!?! you didn’t like veggies until you were a teenager?!? that’s crazy! i loved most veggies growing up. T: lots of people acquire that taste AFTER childhood. I always liked some veggies, just not most of them until I was a little older. Now I’ll eat pretty much anything. A: thank god! so, this really was an extremely easy and tasty meal. 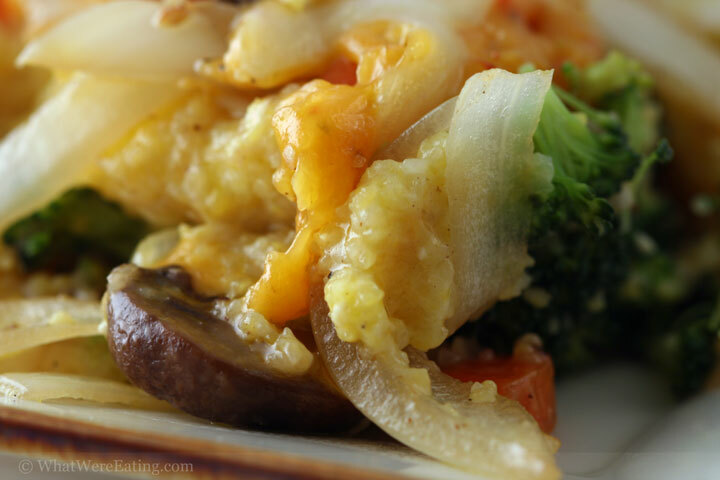 tons of veggies and grits… .mmmmm and cheese…. mmmmmmmmm and bacon. you could always leave out the bacon if you’re a vegetarian or just don’t like it, but in our household there’s a bacon-fest club. and i’m the president! T: And I’m the starving population. Alright, so I rate this meal a 4.49/5. Loved it. I really love that cheese that you used, and the onions and roasted veggies. It was… awesome. It would make a great meal for breakfast, lunch or dinner. Especially on a cold rainy day. You? A: i gotta say you summed it up well. i give it a 4.44/5. it was t-riffic. the sun dried tomato & herb double gloucester is at the top of my cheese list right now. sooooo good. you could make a big thing of this for dinner and just have to heat it up for lunch or breakfast the next day. 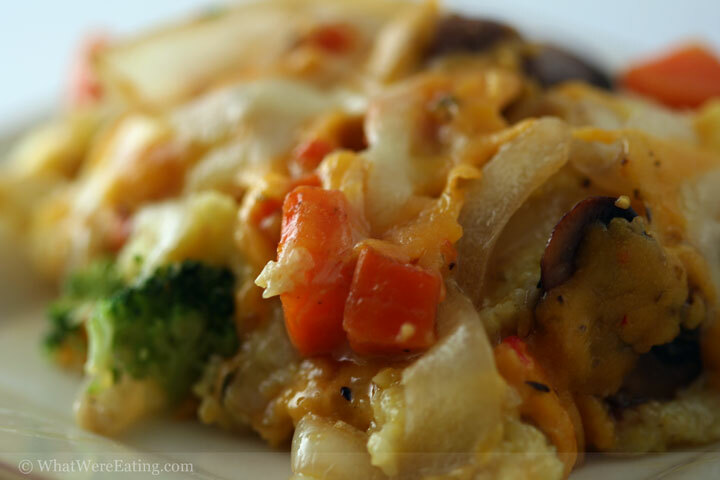 casseroles always seem to scream “comfort food” to me and this one was no different. T: yeah, definitely comfort food. Perfect for the holidays or… whatever, whenever. This stuff is just plain good. A: it’s a shame we didn’t make a big thing of it last night! we could be munching on some right now if we’d had the forethought. T: yeah, forethought… we need to teach past Tyler and Amanda to hook up future Tyler and Amanda. If we plan it out right we can eat 24/7/365. A: uh… yeah.. about that… don’t really want to eat 24/7/365… i think i would be sick of food! T: yeah it’s a ridiculous idea… I’m just hungry. The only thing that would make this better would be a nice, gooey fried egg on top. And maybe some Frank’s Red hot. I’ve been in a casserole phase myself lately, only mine involves polenta and pancetta instead of grits and bacon. I totally support the casserole lovers club by the way…and the bacon-fest club. Can I be vice president? Or at least Sample Girl? I would even wear a cape, if need be. I am THAT committed to bacon. I am so envious I cant get Dave to eat grits. I love them. I am so envious of your grits-laden meals. ack oh god that look incredible. dernit amanda! i hade real grits for the 1st time this christmas, wow – i need to make this..
though i am not much fan of foreign recipes, your recipes look delicious enough that i might like to try out myself!